GTA Gang case defendants charged with robberies, murders found guilty | Russian Legal Information Agency (RAPSI). 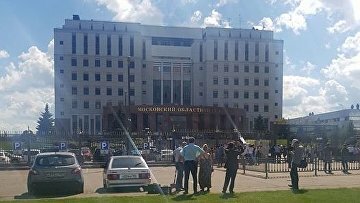 MOSCOW, August 1 (RAPSI) - Five defendants in the so-called GTA Gang case charged with robberies and murders were found guilty on Wednesday, the Moscow Regional Court’s spokesperson Natalya Osipova told RAPSI. According to Osipova, pronouncement of a verdict may last several days. In May, a prosecutor asked the court to sentence the defendants to prison terms ranging from 25 years to life and fine four of them 700,000 – 900,000 rubles ($11,200 – $14,400). On August 1, 2016, nine defendants pleaded partially guilty to the charges. According to investigators, in March 2012, Ibaydullo Suyhanov organized a gang in the Moscow Region. The gang consisted of at least 15 people from Central Asian countries. Allegedly, the gang members were behaving without raising anyone’s suspicions. They worked as taxi drivers, construction workers, guards, many of them had families. Prosecutors claim that from 2012 to 2014 the gang committed 15 robberies resulted in the murder of 17 people and attempted murder of another two. Moreover, the gang members were allegedly behind numerous attacks against automobile drivers. The criminals were installing handmade spikes on the roads causing drivers to stop and murdered victims for their possessions afterward, according to prosecutors. The gang leader was killed in an armed stand-off with the police. Five other members of the gang left Russia and were put on the international wanted list. The trial was marked by shooting that occurred in August 2017 in the building of the Moscow Regional Court. Two guards were accompanying five handcuffed defendants when one of them attacked a guard and tried to strangle the victim while others managed to obtain weapons. On the third floor of the courtroom defendants encountered officers of the National Guard. Three defendants were killed in the shooting, two were gravely injured and hospitalized. One of the officers was shot in a shoulder and guards received multiple traumas, according to investigation. Russian media called the perpetrators of murders in the Moscow Region and M-4 Don highway a GTA gang as a reference to the popular videogame.